This entry was posted on February 28, 2013 at 1:00 am and is filed under Thursday Tangents. You can follow any responses to this entry through the RSS 2.0 feed. You can leave a response, or trackback from your own site. I was really into cyberpunk in college, to the point where I got Walter Jon Williams to autograph my copy of his Hardwired supplement for Cyberpunk. 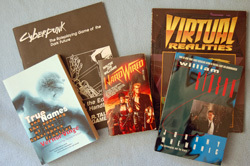 Personally, I liked Voice of the Whirlwind better than Hardwired, but they were two of my favorite cyberpunk books. I read the first two Effinger books. While I enjoyed them, as others noted, he was having a lot of fun transposing New Orleans into the Middle East and decorating it up with cyberpunk. I suspect that transposed spirit was a lot of their charm. I enjoyed Snow Crash too, but I read it as deep on the humor/sarcasm end of the literary spectrum, rather than as straight drama. If cyberpunks were westerns, Snow Crash was the equivalent of Blazing Saddles. Oddly, I never got into The Diamond Age. The one I’m surprised you haven’t mentioned is Bruce Sterling’s Schismatrix. While that one had its own errors (to be fair, they all do), it was the most idea driven of the lot, and IMHO among the best. I suspect it’s poorly known simply because it was so hard to find while the cyberpunk was ascendent. So, what got you “really into” cyberpunk? I’d be curious to know because I’m always eager to be converted to appreciation of a form. Didn’t mentioned the Sterling novel because I hadn’t read it and I guess Alan hadn’t either… Remember, these aren’t scholarly papers (despite the fact that we’ve been repeatedly told they seem that way!). The Tangents are just two friends who love stories talking about them. Well, if you find a copy of Schismatrix, you might like it. If you liked, say, Candide, that is. It’s in much the same spirit. As for why cyberpunk appealed to me? The simple answer is I enjoyed it when I was in college and for many years thereafter. I hadn’t read much noir fiction, so while I recognized the tropes, it was new and different. It was also interesting because it presented what I thought (and still think) is a realistic future. And heck, I like mirrorshades. After all, we’re dealing with veterans with advanced prosthetics, there’s an ongoing build-up to a massive cyberwar, even people talking about using computers to help those with brain damage to regain function (as in Effinger’s books). “The Street finds it’s own uses for things” from Neuromancer was repeated frequently during the early parts of the war on terror, and a lot of change seems to be happening in the slums of the world. If I had to pick between, say, Star Trek and Neuromancer, I’d say Neuromancer got more stuff right, but Star Trek won the war for entertainment dollars. The interesting thing to me is that SF has mostly abandoned cyberpunk, in favor of…what? We’re also past the nanotech-as-fairy-dust movement, but we still seem paralyzed by Kurzweil’s Singularity, telling SF writers that they can’t predict the future because change is accelerating to infinity, and so it’s not worth writing future history any more. It seems so weird, though. We in the SF community should be dancing in the streets, saying that Gibson got it more right than Verne, Asimov, or Roddenberry did. But we don’t. Instead, it’s a set of aging stories. A historical movement, like the New Wave. The authors are respected of course, still writing, but the genre was put away, and I’m not entirely sure why. Perhaps it was “put away” because it did become the now, so it is no longer interesting as the future. I also think people now have a different “feeling” about computers. They’ve lost some of their magic and potential and joined dishwashers as useful but sometimes annoying and very routine tools. That’s an interesting couple of thoughts. I don’t read many modern thrillers, so I don’t know if they’ve gone cyberpunk. I’m still not sure whether ubiquitous computers are the issue, or whether it’s the ick and obsolescence factor. I’m pretty sure I wouldn’t want to stick a cyber-thingie in my brain if it’s going to break in five years and be obsolescent in two or three. On the other hand, Google is trying to commercialize its Google Glasses, so we’re likely to get “enhanced reality” (pardon me while I cough up a hairball on that term), with map overlays on our horribly expensive glasses instead of brain implants for healthy people. Hmm. Yes, definitely something to think about. On a semi-unrelated side note, I went to an interesting blog called “Kung Fu Tea” after reading this. The author is a wing chun teacher and (AFAIK) a professor or research in political economics, and he writes interesting essays about the political, economic, and historical contexts in which modern Chinese martial arts developed. You might find it interesting, both for research for fantasy stories (there is quite a lot of source material that doesn’t have to stay with China. Other martial arts like capoeira and even renaissance fencing schools have similar histories), and because the social turbulence of southern China in the late 19th and early 20th centuries seems very cyber-punkish. Substitute smart-gun AR-15s for dadaos, posit a need for militias in a time of weak government and social unrest, and this material could easily become background for a cyberpunk story, even a straight SF one. Just a thought.